Perhaps Wonder Woman’s greatest superpower is enduring for the past 75 years as a wildly unstable signifier. Patty Jenkins’s Wonder Woman, starring Gal Gadot in the title role, further adds to this complicated, contradictory cluster of signs and symbols. Forged from deeply feminist sympathies, the character debuted in All Star Comics, a predecessor of DC Comics, in 1941 (three years after Superman and two after Batman). She was the creation of William Moulton Marston, who, as Jill Lepore details in her spirited The Secret History of Wonder Woman (2014), proudly claimed that the Amazonian princess was meant to be “psychological propaganda for the new type of woman who…should rule the world.” After Marston’s death, in 1947, the superhero was forced to retreat into domesticity; the comic now featured supplements called “Marriage a la Mode.” The editors of Ms. restored her sisterly derring-do in the early 1970s, putting her on the cover of the first issue of the magazine under the banner “WONDER WOMAN FOR PRESIDENT.” Her second-wave revival continued, however diluted, in the Lynda Carter–headlining TV series that ran from 1975 to ’79. The plastic Pop of that show was fabulously detourned in Dara Birnbaum’s great contemporaneous video piece Technology/Transformation: Wonder Woman (1978–79). The icon has been greeted more warily in this century. Jenkins’s movie (her first since Monster, 2003’s ripe Aileen Wuornos biopic) arrives six months after the comic-book character was dropped as an ambassador for a U.N. campaign seeking to achieve gender equality; the decision was a response to petitioners who objected to the superhero’s “impossible proportions” and scanty, jingoistic costuming. It follows a year after Gadot’s Wonder Woman made a fleeting appearance in Zach Snyder’s Batman v Superman: Dawn of Justice, the intro mandated by the imperatives of franchise-building and continuing the sprawl of the Warner Bros. DC Extended Universe series. 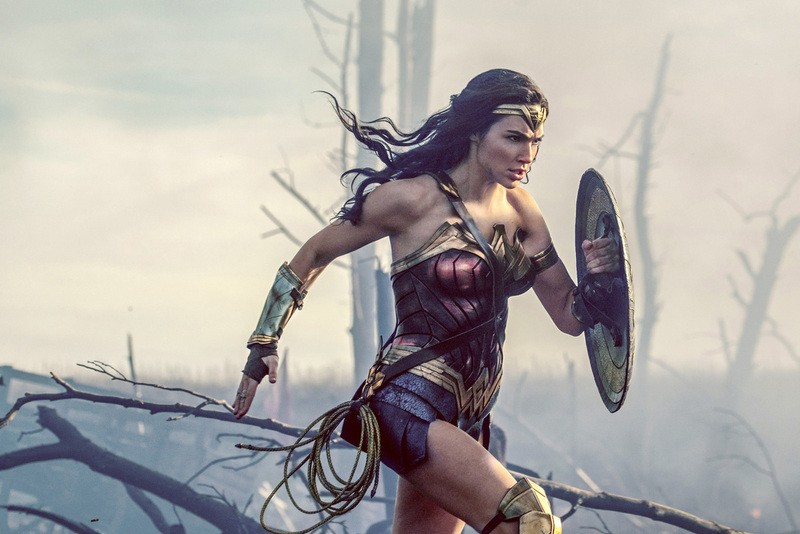 In Jenkins’s Wonder Woman, the battles that structure the movie aren’t those taking place on screen but those behind it, a struggle more salient here than in any other superhero movie: It’s the conflict between the demands of the marketplace (“I think what the studio realized was that they had an asset to exploit, to pull in a larger section of the populace that would ordinarily not be our demographic for that kind of film,” Charles Roven, one of Wonder Woman’s producers, told the New York Times earlier this month) versus the aims of ideology (“Wonder Woman is so hard to put on film because the fight for women’s rights has gone so badly,” Lepore wrote in the New Yorker in 2014). To read the rest of Melissa Anderson’s Village Voice review click here.